Return to the spot where you left the registration if you didn't complete. This registration system is new as of January 15, 2016. If you have not created an account this year, please click [Continue as Guest] to begin the registration process. Youth Registration (17 & under). Must be accompanied by an adult. Create an account for faster registration at future Active Transportation Alliance events. Do you want to create an account now? Which type of team do you want to create? Enter the team name your Team Leader provided. If you do not know it, you can also search by your organizations name. There can be multiple teams under one organization, make sure to join the right one, ask your Team Leader if you're not sure! Are you an Active Transportation Alliance Member? Renew your Active Transportation Alliance membership today! I would like to decline receiving the gifts that come with my membership. Become an Active Transportation Alliance Member today! Add a one year Active Trans membership to your registration for a discounted rate. Membership includes Chicagoland Bicycle Map, discounts to retailers and a $10 discount on DIVVY. Add a one year Active Trans family membership to your registration for a discounted rate. Membership includes Chicagoland Bicycle Map, up to 4 additional member cards, discounts to retailers and a $10 discount on DIVVY. You can choose to have your event shirt mailed to you or you can pick up at an official Packet Pick Up location. If you don’t need another event t-shirt, now’s your chance to opt-out by unchecking the box on the left. When you take a pass on the t-shirt, you pass on the savings to Active Trans, which helps us to do more to promote safer walking and biking! Final artwork may vary. *Shipping available in the continental US only. Show your Fifth Third Bike the Drive pride with this limited edition cycling cap! Conquer Lake Shore Drive and tackle all 30 miles on May 26th! You'll receive a 30 Mile Challenge racing bib to show that you’re riding for glory on event day AND if complete the entire 30 mile course*, you'll receive a limited edition 30 Mile Challenge medal to commemorate your triumphant achievement! *To receive the limited edition 30 Mile Challenge medal, you must track your milage on a smart phone with an app of your choice, such as Ride with GPS, Strava, or Map My Ride. When you are finished with your bike ride, enjoy an unlimited pancake breakfast, with sausage and orange juice in Butler Field of Grant Park. Coupons purchased will be included in rider packets, and also available for purchase at the festival. Take a spin through Chicago’s history and uncover hidden gems you never knew existed. Join Active Transportation Alliance for the Boulevard Lakefront Tour in August 2019, our classic summer ride! Bike through some of Chicago’s greatest neighborhoods while checking out historical landmarks and points of interest. Explore the city, choose your distance. The Boulevard Lakefront Tour will take place on Sunday, August 11, 2019. For more information, visit bltride.org. Please take a moment to complete this questionnaire! 1: How did you hear about Fifth Third Bike the Drive? 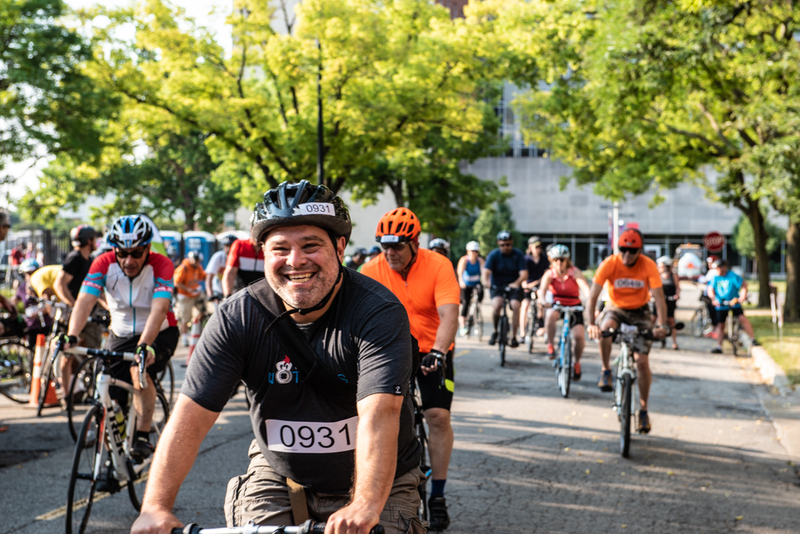 2: How many times have you previously participated in Fifth Third Bike the Drive? 3: Would you like to receive Active Transportation Alliance's email newsletter and stay up-to-date on our latest work to improve biking, walking, and public transportation in Chicagoland? Please carefully read the following waiver. A waiver must be signed for each individual registrant. Active Transportation Alliance ("Active Trans") is affiliated with events for bicycle riding, bicycle racing and other bicycling events ("Bicycling"). In consideration of being allowed to participate or volunteer in Bicycling, I agree to the terms and conditions contained in this Waiver and Release of Liability. I or my agent acknowledge and agree: (i) Bicycling is a strenuous activity beyond the capability of some people, and may cause minor, severe and/or permanent injuries or death to people who are not in sufficient physical fitness, training and/or experience; (ii) I have made my own determination as to whether I am able to safely participate and/or volunteer for Bicycling; (iii) Active Trans has not evaluated my ability to participate in Bicycling; (iv) advice dispensed through Active Trans may not be appropriate for me, and it is my responsibility to make this determination; (v) Bicycling is or may be a test of a person's physical and mental limits and carries with it, regardless of physical fitness or experience, the potential for death, serious injury and property loss; (vi) risks of participating in or volunteering for Bicycling include, without limitation, those caused by terrain, facilities, temperature, weather, condition of athletes, equipment, vehicular traffic, actions of other people including, but not limited to, participants, volunteers, spectators, coaches, event officials, and event monitors, and/or producers of the event, and lack of hydration; and (vii) that liability may arise from negligence or carelessness on the part of the persons or entities being released, from dangerous or defective equipment or property owned, maintained or controlled by them or because of their possible liability without fault. These risks are not only inherent to athletics and participants, but are also present for volunteers; I or my agent certify that my level of fitness is appropriate to participate in or volunteer for Bicycling and that I am voluntarily undertaking participation or volunteering in Bicycling. I or my agent certify that I have sufficiently trained or prepared for participation in or volunteering for Bicycling. I am undertaking of my free will participation or volunteering in Bicycling, and I have not been advised against participation in such activity by a health care professional. I agree to wear an ANSI, CPSC, or SNELL approved helmet properly at all times while participating in Bicycling affiliated with Active Trans. I or my agent, for myself, my past, present and future agents, attorneys, representatives, predecessors, successors, assigns, heirs and executors (collectively "Participant Parties"), do hereby waive, release, and discharge Active Trans, the City of Chicago, the Chicago Park District, Fifth Third Bank, N.A. and each of their respective past, present and future officers, directors, agents, employees, parents, subsidiaries, predecessors, successors, affiliates, assigns, sponsors, volunteers (including any individual giving a presentation, advice or information in conjunction or associated with Bicycling), attorneys, any Active Trans members or representatives (collectively the forgoing are "Active Trans Parties") from any and all manner of liability, claims for damages, causes of action, proceedings, losses, compensation, attorneys' fees, costs, and expenses of suits, claims and demands whatsoever or any kind, which have or may arise in the future from my participation in or volunteering for Bicycling through or involving Active Trans, including, but not limited to, any and all claims, losses or liabilities for negligence, death, injury, disability, property damage, medical bills, theft or damage of any kind, including without limitation economic losses (collectively, "Losses"), which have or may in the future arise out of or relate to my participation in, volunteering for, or traveling to and from Bicycling via bicycle, car, public transportation, foot, or any other method through or involving Active Trans. I or my agent acknowledge that there may be mode of transportation, persons, dangerous or adverse road or path conditions, hazards, wildlife or hidden objects present during Bicycling through or involving Active Trans. I or my agent understand all of the risks, known and unknown, associated with Bicycling, including without limitation, all those so stated in this waiver and release of liability and all those known and unknown. I or my agent assume the risks, both known and unknown, related thereto of participating in or volunteering for Bicycling through or involving or associated with Active Trans. I or my agent assume all other risks, known and unknown, associated with participating in or volunteering for Bicycling through or involving or associated with Active Trans, including without limitation contact or effects of other participants and effects of weather. I or my agent, on behalf of myself and Participant Parties, AGREE NOT TO SUE or otherwise bring any claim or proceeding for Losses against any Active Trans Parties for any and all Losses assessed against them as discharged herein. I or my agent GRANT PERMISSION to Active Trans, and those acting by or on behalf of or under its authority the unconditional right to use my name, voice, photographic likeness and physical likeness relating to my participation in or volunteering for Bike the Drive or other Bicycling event for which Active Trans is so associated. This waiver and release of liability further authorizes Active Trans to edit, to telecast, to webcast, to podcast, to cablecast, to rerun, to duplicate, to use, to syndicate, to license and to distribute in any medium or form said production (collectively "Media"). I or my agent hereby agree, acknowledge, and grant that at creation, Active Trans has and will continue to have all right, title, and interest in and to such Media to do with such Media as it chooses for its independent business purposes or to do nothing at all with such Media. To the extent I have any right, title, or interest in such Media, I hereby assign such to Active Trans. I or my agent further agree that the Media and all rights therein are entirely the property of Active Trans, its licensees, successors and assigns, absolutely and forever, for any and all copyright terms and all extensions and renewable terms of copyright whether now known or hereafter created throughout the world, and for all uses and purposes whatsoever. I or my agent WAIVE, to the extent I have any, all rights to any current or future compensation to which I may be entitled as a result of use of my name, voice, photographic likeness or physical likeness in such Media. I or my agent hereby consent to receive medical treatment that may be deemed advisable in the event of injury, accident, and/or illness during this Bicycling event. I or my agent WILL INDEMNIFY AND HOLD HARMLESS the Active Trans Parties from any and all Losses assessed against them arising or as a result of (i) my actions, inactions or negligence, (ii) the actions, inactions or negligence of the Active Trans Parties and others hereby indemnified, (iii) the conditions of the facilities, equipment or areas where Bicycling is being conducted and (iv) any other harm, injury or damage caused by an occurrence related to or during Bicycling through or involving Active Trans. This Waiver and Release of Liability will be construed broadly to provide a release and waiver of liability and those affirmative consents and covenants to the maximum extent permissible under applicable law. If any provision is held by a court of competent jurisdiction to be unenforceable, then that provision is to be construed either by modifying it to the minimum extent necessary to make it enforceable or, if not so allowed by law, disregarding such provision, and all other provisions of this waiver and release of liability are to reaming in effect as written. This waiver and release of liability will be governed and construed under the laws of the State of Illinois, without giving effect to its conflict of law rules. I OR MY AGENT AFFIRM THAT THAT I AM THE PRIMARY REGISTRANT, I AM EIGHTEEN (18) YEARS OF AGE OR OLDER, AND I HAVE READ THIS DOCUMENT AND UNDERSTAND ITS CONTENTS. IF REGISTERING A MINOR, I represent that I am the custodial parent or legal guardian of the minor. I consent to the terms of the foregoing application form, including the waiver and release of claims and indemnity on his/her behalf. I affirm I have the authority to grant such consent. In the event the foregoing affirmation is not accurate, agrees to save and hold harmless and indemnify each and all of the parties referred to above from all liability, loss, cost, claim or damage whatsoever which may be imposed upon said parties because of any defect in or lack of such capacity to so act and release said parties on behalf of the minor and the parents or legal guardian. I/my agent agree with the terms and conditions above. You must login or create an account to be able to create a team. Do you want to create an account now? You can only create team in the first registrant!